Tee hee! Yes it is December 1st, and despite being 27 and 28 respectively, neither me nor the boy are to old for a choccy advent calendar. Though the chocs seem a lot smaller than I remember them being when I was a kid! Mine is the Hello Kitty (blates) and his is the Toy Story 3 one. Yum! I have to apologise for these pictures, they have come off my phone as I had lost my charger cable for my netbook (it has now been found!) so I have had no computer for the last couple of days. I am using the boy's mac, but wouldn't have a clue how to put photo's on it, so my camera and blogger for Android has had to suffice. Sorry about that! Ok so ladies (and gents, if you're into this type of thing...): I need help with HAIR STRAIGHTENERS. Basically my trusted pair have pretty much given up and so I need to buy a new pair/ask for them for Christmas, but I have no idea where to start. Let me explain. Around a decade ago (seriously) the ceramic straightener was fairly new to the market-I could find only 2 brands, GHD, or another make called Ceramic Tech. I saved up my money from my weekend job in a coffee shop, and paid £100 for a pair of Ceramic Tech pro straighteners from a salon. At this point I hadn't found anywhere near me that sold GHD's and I didn't realise how huge that brand would become. The Ceramic Tech straighteners were amazing. Prior to getting them, I used to straighten my hair with a teatowel and a steam iron-can you believe it. I actually got so used to doing this I stopped being careful with it and one day slipped and whammed myself in the face with the tip of the iron, I burnt half my eyebrow off and that's how come I started wearing a side fringe. I'm kidding-only about the side fringe part though! It was lucky I could cover up my blistered eyebrow with my hair! So yes. What a purchase. That £100 pair of straighteners has been used probably 3-4 times a week for 10 years, which I think is pretty good going-they were worth the outlay. They're only failing now because I use them to curl my hair and it's made the wiring start to split. Eek. So now I need help with how to replace them! As time went on, GHD emerged as the market leader and I don't know whether Ceramic Tech straighteners are still available? I know most of my friends have had trouble of some kind, at some point, with GHD's, are they as good as they say? Either way, technology has moved on so much since I bought mine-a quick look in the Sainsbury's electrical aisle earlier left me floundering...there were mini ones, long ones, Ionic ones, ceramic ones, zebra print ones, glitter ones, basic ones, curling ones....help!! What I would like is a good product recommendation and I know you guys will be the best people to ask. So....GO! 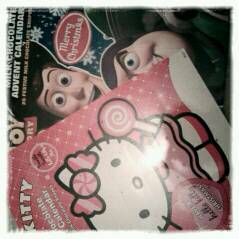 I have the hello kitty advent calender. One word: poor! Hi Amie, God i remember the days of the fizz do, sometimes I wonder how on earth I wasnt arrested by the fashion police for sporting such a frizz! On the straightner issue, I have to admit that I am a faithful GHD customer, and can't see past them. However I am onto my 2nd pair (3rd pair arriving via santa) in a space of 7 years, My mum dropped a pair and they stopped working, my current pair still work but I dropped them about 2 weeks ago and they now have a huge crack down the middle, so I've asked for another pair for xmas! I think GHDs are definitely the best. I've had mine for about 8 years using it a few times a week, its travelled across continents with me and I've never had a problem with it! Definitely recommend! I use the GHD IV styler and mine are perfect for doing both straight and curly styles. I used to use the larger size of GHD's because I have really thick hair, which I got around 5 years ago, but as they're not as good for curling I replaced them with the slimmer size. The large pair are still working though and are used by my mum and sister! So I definitely recommend GHD's as they are very reliable and the slimmer size would be ideal for your hair I would think. Just make sure you buy them from a reputable company as there are a lot of fakes out there!